Dehydration refers to an inadequate amount of fluid in the body. 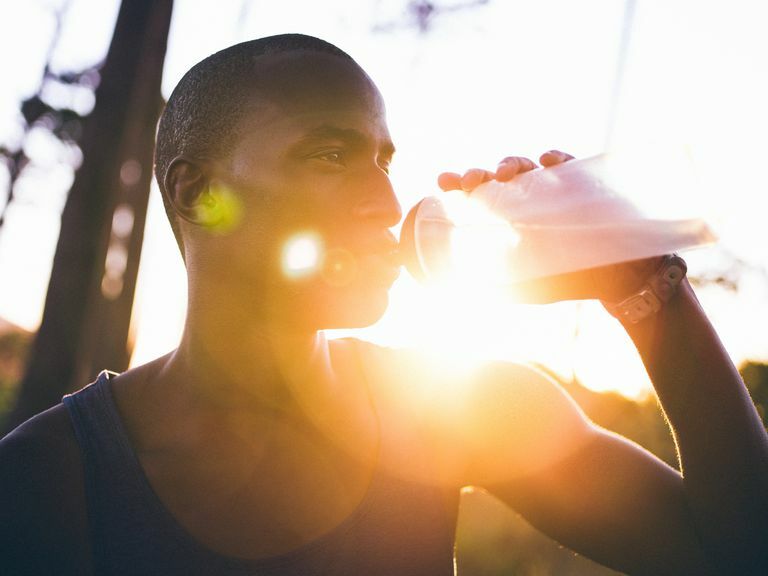 Among athletes who participate in endurance sports, dehydration can occur very quickly and often without notice. Generally speaking, people are considered dehydrated when they have lost more than two percent of their body weight, whether through activity, severe diarrhea, or vomiting. Adequate fluid intake is considered essential before, during, and after any strenuous physical activity. The decision to use a sports drink or just plain water depends largely on the duration and intensity of the workout. Dehydration occurs when you lose more fluid than you take in, and your body doesn't have enough fluids to carry out its normal functions. Thirst is not a reliable indicator of early dehydration. Many people, particularly those in the midst of strenuous activity, don't feel thirsty until they are already dehydrated. You can often tell if your dehydrated if your skin "tents" when pinched (meaning that it doesn’t bounce back quickly when released). When engaging in endurance sports, the best way to avoid dehydration is to obey your thirst. You should drink when either your mouth is dry or when you feel a physical need for it. In extreme cases, fainting (syncope), seizures, and even coma have been known to occur. Most studies have shown that high-intensity athletes lose up to two grams of salt per liter of sweat. Replacing this before, during, and after exercise is critical to performance and safety. Pay extra attention when it is extremely hot and humid, and gauge your intake accordingly. How much you need to drink depends largely on your fitness level, the weather, and how much you sweat during the activity. Before the activity, drink about 500 milliliters (mL) of fluid one to two hours in advance. Weighing yourself and calculating your body mass index (BMI) provides you a baseline for comparison after the event. For activities lasting longer than an hour, athletes should drink between 600 and 1200 mL/hour of a sports drink containing carbohydrates (sugars) and salt. It is important to swig rather than chug the drink to prevent the sloshing of fluid in the stomach. After an activity, use your urine color, BMI, and thirst level as an indication of how dehydrated you may be. If you’ve lost three pounds in one hour of exercise, you need to drink at least three 16 ounces glasses of fluid to make up for the loss. Baker, L. "Sweating Rate and Sweat Sodium Concentration in Athletes: A Review of Methodology and Intra/Interindividual Variability." Sports Med. 2017; 47(Suppl 1):111-128. DOI: 10.1007/s40279-017-0691-5. O’Neal, E.; Wingo, J.; Richardson, M. et al. "Half-Marathon and Full-Marathon Runners' Hydration Practices and Perceptions ." J Athl Train. 2011; 46(6):581-591. Is It Better to Focus on Strength or Endurance During Weight Training? Do You Know When and How Much to Drink for Exercise?